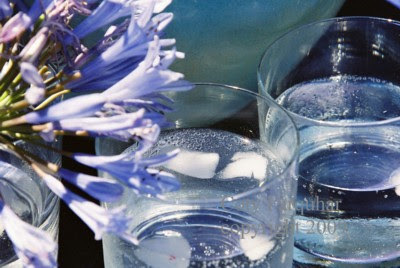 On hot days in Australia the only thing that is ever wanted is water, huge jugs of icy cold water. This blue jug is enormous and holds plenty of cool water, it belonged to Andrew's mother and it is quite old. 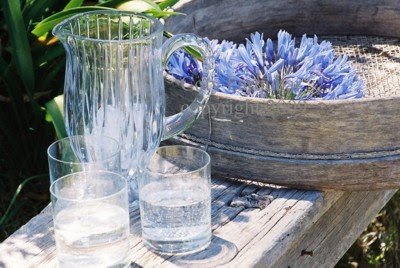 I love the shape of the jug, it is quite heavy when full and always pours so beautifully. 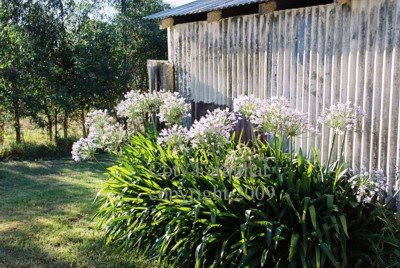 An old Australian shed on a near by property with yes more agapanthus. 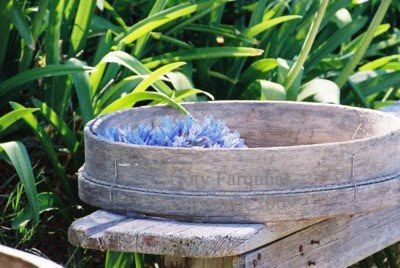 This is an old country sieve and I use it as a tray, I love using all these old farm objects in my table settings, the long stool came from the movie Babe, the Australian talking Pig movie filmed nearby in Robertson. I love the worn out wood and the pale colour of the timber. 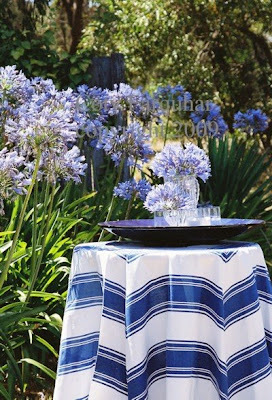 The blue and white french striped table cloth above is from an old umbrella. I unpicked it of the metal frame, I love it and it is a perfect circle for this little table. 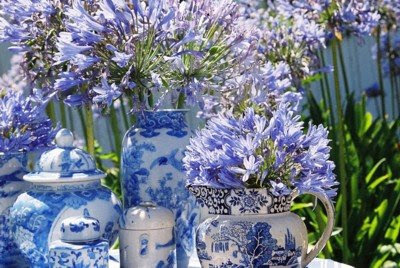 Just a little bit more blue china.............I just can't help myself. 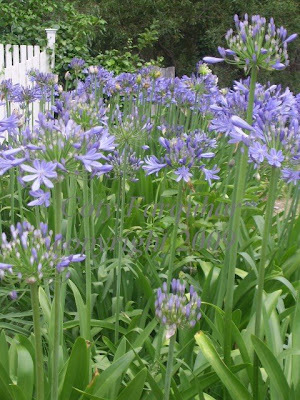 I have been in a bit of a blue mood this week - from my gardening posts through to my entertaining ideas, something different to share with you. I hope your enjoy your visit. Another elegant, beautiful Tablescape Thursday. I love coming here. It fills my day with light. Absolutely beautiful! And yes who can say no about blue china...just who can say no? It is lovely as usual! 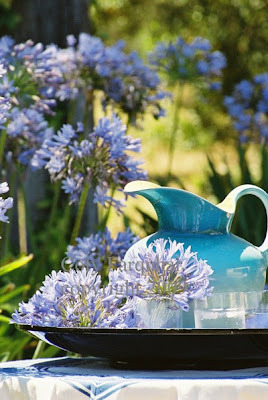 I am envious of the color in the garden and how spring everything looks...while we are chilly here in S. Calif! Your blue mood is a vision to us all!!! Love it! Absolutely stunning photography! I love the blue. That flower is my very favorite even though I can't grow it here in northwestern Pennsylvania, USA. I wish I was with you now to enjoy that lovely setting. I've been wishing that blue would come back "in" (nothing against the earth tones, which has been our "in colors" for awhile here in the US). Your post makes me hope again. 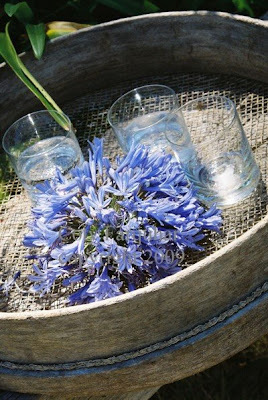 The story behind the blue jug makes the tablescape that much more special. I have lots of lovely blue things ... all packed away and waiting. Your styling and photography are nothing short of exquisite. Makes me wish for summer here. 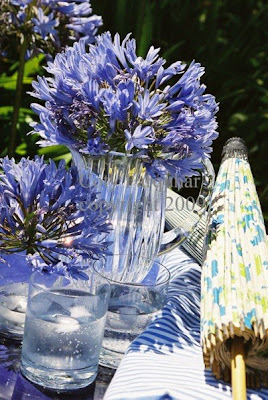 Beautiful use of agapanthus with your table! Such a great background!